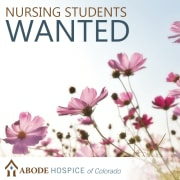 Abode Hospice is in need of nursing students for internship hours! Are you getting your associates degree in nursing or bachelor's degree in nursing? Are you considering hospice nursing as an option? At Abode Hospice, we are in need of nursing interns who would like to learn whether hospice nursing is a good fit for their career trajectory. At Abode Hospice, we are committed to enhancing the quality of life for patients living with life-limiting illness. This includes addressing the medical, social, spiritual, psychological and emotional well-being of patients and their families. As an intern with Abode Hospice, you will accompany our nurse case managers on visits to patients. Our patients reside all over the Denver metro area and receive hospice care in their residence (private home, group home, assisted living community and skilled nursing facility). As an intern, you will see first-hand what hospice nursing involves as well as our interdisciplinary approach to care that involves a medical director, nurse case manager, CNA, chaplain and social worker. If you are looking to make a difference with your degree in nursing, consider interning with us at Abode Hospice! We provide extensive training on the hospice model of care and we invite you to join our team!